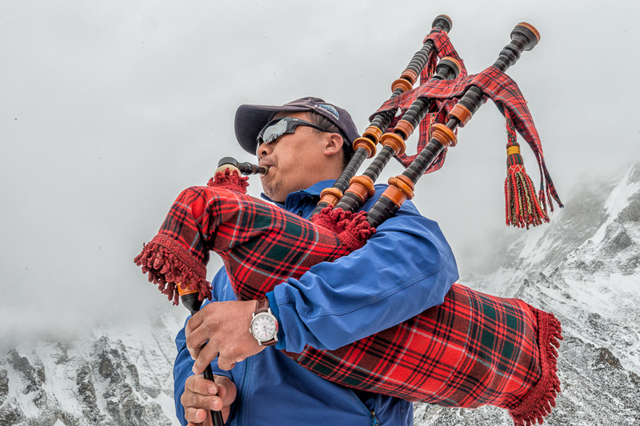 KEEPING WATCH: A Gurkha soldier playing a bagpipe at Mt Everest Base Camp this month sporting a Loomes watch that will be auctioned to raise money for earthquake survivors in Nepal. Sixty four years after Edmund Hillary and Tenzing Sherpa took a Smiths watch to the summit of the world’s highest peak, a British Gurkha expedition to Mt Everest has taken two hand-made watches to the top so they can be auctioned to raise money for earthquake relief in Nepal. Sixty four years after Edmund Hillary and Tenzing Sherpa took a Smiths watch to the summit of the world’s highest peak, a British Gurkha expedition to Mt Everest has taken two hand-made watches to the top so they can be auctioned to raise money for earthquake relief in Nepal. The exclusive Loomes watches will be auctioned in London in the next few months and the money handed over to Mountain Trust, a charity based in England and working in Nepal, and Gorkha Welfare Trust, a charity working for families of Gurkha soldiers in the British Army. Mountain Trust will use funds collected from the auctions to help earthquake victims in Gorkha by rebuilding their houses and supporting a radio educational project called Radio Guru. The Gurkha Welfare Trust, meanwhile, plans to use the money for the welfare pension of Gurkha retirees. The expedition was planned for 2015 to mark the 200th anniversary of the beginning of Gurkha recruitment into the British Army after the end of the Anglo-Nepal War in 1816. However, the team had just made it to Camp II when the earthquake struck, triggering an avalanche at Base Camp that killed 18 climbers. The expedition was stuck above the Ice Fall and members later helped in the rescue effort when they eventually got down to Base Camp. The watch summiteers took with them in 2015 has already been auctioned for £7,400. After that the expedition spent two years training in Scotland and the Alps for this year’s climb. On 16 May, the 13-member team that included nine Nepalis and four British soldiers became the first expedition to summit Mt Everest this season (pictured, above). This is the first time serving Gurkhas has made it to the top. 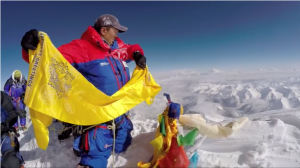 Milan Rai of British Gurkha Riffles reckons climb and the watch auctioning idea is an opportunity to use the challenging of climbing the world’s highest mountains while at the same time helping Nepali people who are in need. Loomes specialises in handsome hand-made timepieces and donated two watches costing £9,850 each, to be taken to the top of Mt Everest to be auctioned. Bentley believes that the watches which summited Everest, could be sold for up to £20,000 each.